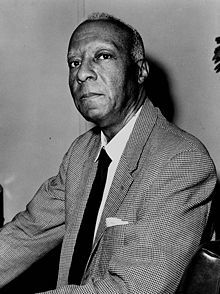 The American labor and civil rights leader A. Philip Randolph, considered the most prominent of all African American trade unionists, was one of the major figures in the struggle for civil rights and racial equality. Asa Philip Randolph was born in Crescent City, Florida, on April 15, 1889, the second of two sons of James and Elizabeth Randolph. His father was a traveling minister of the African Methodist Episcopal Church and his mother was also devoted to the church. Both of his parents were strong supporters of equal rights for African Americans. The young Randolph had a close relationship with his older brother, William. The brothers' early childhood games included role playing in which they worked for African American rights. The family moved to Jacksonville, Florida, in 1891. Asa attended local primary schools and later went on to the Cookman Institute in Jacksonville, Florida. In the spring of 1911 Randolph left Florida for New York City, where he studied at the City College of New York while working as an elevator operator, a porter, and a waiter. While taking classes at the City College, Randolph discovered great works of literature, especially those of English playwright William Shakespeare (1564–1616), and he also began to sharpen his public speaking skills. Randolph's belief that the African American can never be politically free until he was economically secure led him to become the foremost supporter of the full integration of black workers into the American trade union movement (bringing blacks into the ranks of trade unions, which fight for the rights of workers). In 1925 he undertook the leadership of the campaign to organize the Brotherhood of Sleeping Car Porters (BSCP), which would become the first African American union in the country. The uphill battle, marked by fierce resistance from the Pullman Company (who was then the largest employers of African Americans in the country), was finally won in 1937 and made possible the first contract ever signed by a white employer with an African American labor leader. Later, Randolph served as president emeritus (honorary president) of the BSCP and a vice-president of the American Federation of Labor and Congress of Industrial Organizations. In the 1940s Randolph developed the strategy of mass protest to win two major executive orders, or orders from the government. In 1941, with America's entrance into World War II (1939–45), he developed the idea of a massive march on Washington, D.C., to protest the exclusion (to keep out) of African American workers from jobs in the industries that were producing war supplies. He agreed to call off the march only after President Franklin Roosevelt (1882–1945) issued Executive Order 8802, which banned discrimination (selection based on race) in defense plants and established the nation's first Fair Employment Practice Committee. In 1948 Randolph warned President Harry Truman (1884–1972) that if segregation (separation based on race) in the armed forces was not abolished (to put an end to), masses of African Americans would refuse entering the armed forces. Soon Executive Order 9981 was issued to comply with his demands. In 1957 Randolph organized the Prayer Pilgrimage to Washington to support civil rights efforts in the South, and in 1957 and 1958 he organized a Youth March for Integrated Schools. In August 1963, Randolph organized the March on Washington, D.C., fighting for jobs and freedom. This was the site of Martin Luther King Jr.'s (1929–1968) famed "I Have a Dream," speech, and a quarter million people went in support. Randolph was called "the chief" by King. And in 1966, at the White House conference "To Fulfill These Rights," he proposed a ten-year program called a "Freedom Budget" which would eliminate poverty for all Americans regardless of race. The story of Randolph's career reads like a history of the struggles for unionization (creating trade unions) and civil rights in this century. He lent his voice to each struggle and enhanced the development of democracy (government by the people) and equality in America. Randolph always said that his inspiration came from his father. "We never felt that we were inferior to any white boys," Randolph said. "We were told constantly and continuously that 'you are as able,' 'you are as competent,' and 'you have as much intellectuality as any individual.'" Randolph died on May 16, 1979. Throughout Randolph's years as a labor and civil rights leader, he rocked the foundations of racial segregation, pressuring presidents and corporations alike to recognize the need to fix the injustices heaped on African Americans. Embracing a nonviolent, forward-looking activism, Randolph will be remembered as both a radical activist and "Saint Philip." What's sad is we have let our children down. We haven't taught them anything and that is why they value nothing. Try asking a young person who A. Phillip Randolph was and see what kind of answer you get. It's shameful. But then again we don't have enough sense to be ashamed.